Ampelmann, the global provider offshore access solutions, has announced an exclusive partnership with Seaqualize, a Dutch marine motion technology innovator, to collaborate on the development of its latest S-type gangway. 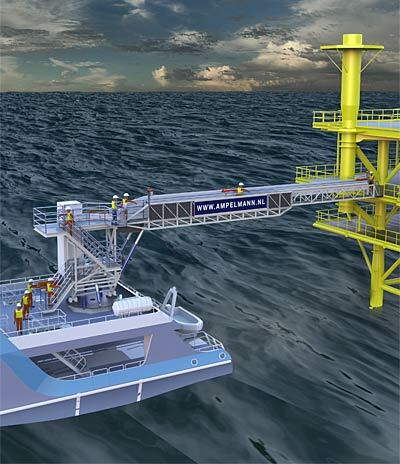 Ampelmann develops and manufactures motion compensated offshore access systems and its latest gangway solution, the S-type, is designed specifically to be fully integrated into large, high speed vessels and dedicated to long-term crew change operations. Key factors to the success of these vessels are speed, comfort and low fuel consumption. The S-type is designed to safely compensate the challenging motion characteristics of these vessels when in dynamic positioning (DP) alongside the platform. This is combined with a significant reduction in power requirement and weight of the gangway itself. Part of the solution comes from the balanced heave compensation technology of Seaqualize. This patented technology engages the non-linear force of a gas spring to create an easily adjustable counterbalance, enabling balanced heave compensation. Numerical and scale models already tested have demonstrated the energy efficiency of luffing can be increased to more than 90%. The full-scale prototype is funded by a subsidy of the Dutch Ministry of Economic Affairs through top sector energy. While targeted predominantly towards the crew change market the offshore wind market will also hold opportunity for this new generation of gangway, due to the reduction in power requirements and weight. Production is due to start on the S-type in early 2018. In total, the cost of operators using the system will be around 30% cheaper than helicopters. The S-type builds on Ampelmann’s track-record of innovative design by incorporating a lightweight system that uses a low amount of energy to operate. For the global oil and gas market where volume of crew is high and the sea state can be severe, the S-type can continuously transfer 50 people and luggage in five minutes in significant wave heights of up to three to four metres. The S-type design can be tailored for installation to individual vessels and is expected to be a particularly attractive option on current or new build fast or light-weight medium-sized vessels; such as mono-hulls, catamarans and trimarans.